As the world’s population continues to grow, finding innovative ways to develop solutions to the planet’s environmental problems is becoming increasingly important. In regions where this growth is far outpacing the global average, the need is even more urgent. Take India, for example. It’s a massive country with a rapidly expanding population and it faces several major environmental challenges. But look closely at its booming transportation market and you’ll notice that sustainable technology is starting to have an influence and make a difference. 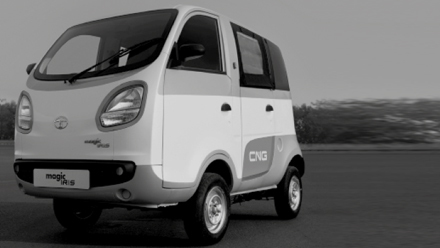 Vehicle manufacturer Tata has just launched the Iris, a small people mover designed to compete with the common rickshaw – which is open-sided and regarded by many as being unsafe. The introduction of the Iris is also significant to AkzoNobel because it uses the company’s Interpon A5000 powder coatings. The technology is a natural choice for innovative companies such as Tata. Why? Because powder products have virtually no VOCs and can be recycled or reclaimed. Powder’s environmental credentials are further enhanced by the fact that it’s a totally dry, non-liquid coating, so there’s no need to use water during manufacturing. The technology – which helps to save energy and doesn’t compromise on performance – is therefore one of few truly sustainable options well positioned to grow. The Iris was launched at Tata’s new plant in Dharwad, south west India, which is expected to produce 300 vehicles per day utilizing our powder technology. AkzoNobel’s Powder Coatings business also worked with Tata on the successful ACE truck, assembled in Pantnagar.